Most bathroom faucets that have two handles are cartridge-style faucets. Each faucet handle (hot and cold) has its own cartridge, a valve that turns with the handle to control the flow of water into the faucet spout. If you have a very old two-handle faucet, it may be a compression-type rather than a cartridge. You'll know when you remove the faucet handle: Cartridges are usually plastic and are held in place with a metal retaining nut; compression faucets usually have a metal valve with a flat rubber washer on the bottom. If your two-handle faucet is leaking, feel the water to determine which side is leaking, hot or cold. You need to replace the cartridge on only the side that's leaking. However, it's possible that both sides are leaking and you'll have to replace both cartridges. Look under the sink to locate the shutoff valves on the water supply lines for the faucet. Most shutoff valves have a small, football-shaped handle or a lever that rotates. 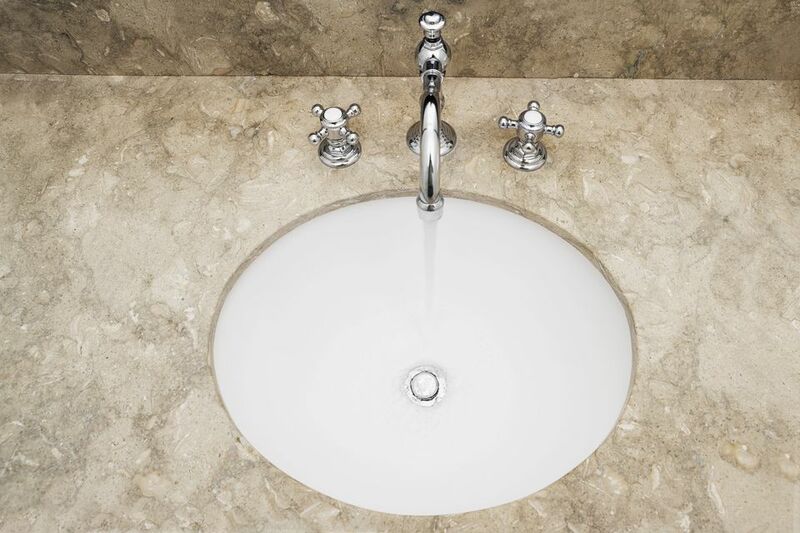 Close the valve for the faucet tap you will be working on by turning the handle clockwise until it stops. If your house does not have shutoff valves under the sink, turn off the water supply to the house at the main shutoff valve. Once the water is shut off, open the faucet fully to release any pressure in the water lines and let any water drain out. Examine the faucet handle to determine how it is installed. Some handles have setscrews on the side or rear. Others have a decorative cap (usually plastic) that conceals a screw that secures the handle. Your faucet may also have a removable lever that unscrews from the handle base to allow easy access to the handle setscrew. If your faucet has a decorative cap, pry off the cap with a small flathead screwdriver, then remove the handle screw with a Phillips screwdriver. If your faucet has a setscrew, remove the setscrew with an Allen wrench. Pull straight up on the handle to remove it from the faucet body. Loosen the cartridge retaining nut, using a pipe wrench or tongue-and-groove pliers. Unscrew the nut all the way and remove it from the faucet body. Note the brass screw at the top of the cartridge, if there is one. Its purpose is to reinforce the cartridge shaft when the faucet body's setscrew is tightened against it. You may need to remove this old screw and reuse it in the new cartridge, as not all replacement cartridges come with a new screw. Note the orientation of the faucet cartridge. You must reinstall the new cartridge in exactly the same way. Most cartridges have one or two tabs that fit into notches on the faucet body. Pull the cartridge straight up to remove it from the faucet body. If necessary, grab the shaft at the top of the cartridge with pliers to pull out the cartridge. Bring the old cartridge with you to the hardware store or home center to find an exact replacement. New cartridges typically include new rubber O-rings for the cartridge. If desired, also pick up some plumber's grease for the O-rings. This makes it easier to insert the cartridge into the faucet body and is an especially good idea if the old cartridge was difficult to remove. Replace the little brass screw in the top of the cartridge shaft, if necessary. If you have plumber's grease, apply a small amount to the cartridge's O-rings, using your finger. Insert the new cartridge into the faucet body in the same orientation as the original cartridge, aligning any tabs on the cartridge with the notch(es) on the faucet body. Push the cartridge all the way into the housing. Secure the cartridge with the retaining nut, tightening the nut carefully (do not over-tighten) with the wrench or pliers. Reinstall the faucet handle and setscrew or Phillips screw as well as the decorative cap, as applicable. Turn on the shutoff valve for the water supply to the tap by opening it counterclockwise all the way. Test the faucet for proper operation.